Australia, the land ‘of drought and flooding rains’, has witnessed a number of disasters over the years, with the most severe occurring in the last decade. Samuel Beattie explains the importance of resilience around these disasters. In 2009, the Black Saturday bushfires swept across Victoria and destroyed more than 2,000 homes and were responsible for the death of 173 people; in 2010/2011, severe floods in Queensland forced the evacuation of thousands of people from their homes, causing over $5 billion worth of damage to the state, and; for the 10 years between 2004 and 2014, Local Government Areas in NSW were impacted by natural disasters 905 times. Clearly, disasters impact all Australians across the country and have the ability to cause large-scale disruption to people’s lives and communities. It is, therefore, important to ask ourselves the question, how do we prepare for a disaster? The term ‘resilience’ was first used in psychology to describe the ability to cope with or to ‘bounce back’ from adversity and trauma. It has been central to the community sector for decades and viewed as a means from which to provide support and care to individuals during times of stress. In recognising the important role that communities play before, during and after a disaster, resilience has been increasingly incorporated into the emergency management sector. From the international level down to the local level, various emergency management frameworks have been actively incorporating the role of the community into disaster risk reduction. Have you heard of the Sendai Framework? In 2015, representatives from 187 countries came together in Sendai, Japan to discuss the future of disaster risk reduction globally. After 10 years of using the Hyogo Framework, governments wanted to create a document that spoke to more people across all aspects of society, with a more explicit focus on individuals’ health and livelihood. The Sendai Framework is the international framework for disaster risk reduction and is changing the way communities and emergency services work together. Interestingly, Sendai is a location that bore long lasting impacts of the 2011 Japanese Tsunami, which followed a 9.0 magnitude undersea earthquake off the eastern coast of Japan. The once quiet and rural region of Japan, known for its green mountains and sweet summer peaches, was inundated by a 40m wave that crashed across the country’s vast coastline, destroying a large number of coastal towns and causing the infamous Fukushima nuclear power plant to meltdown. Seven years on, the region is still recovering, making the Sendai framework all the more relevant to understand today. There is a well-known story in Japan that describes how communities reacted to similar disasters hundreds of years ago. The story of Hamaguchi Gohei and the Tsunami is one of an elderly man, Hamaguchi, living in a large thatched hut on a plateau of a mountain devoted to rice fields. From his house, Hamaguchi sees the ocean withdraw from the coast and recognises the early warning signs of an impending tsunami. In the absence of early warning systems and disaster education, the elderly man lights his rice fields on fire, destroying his life-long investment. One by one, some 400 villagers, in a bid to extinguish the fire, run up the hill leaving their curiosity of the changing ocean behind. Amongst cries from those of young and old upon witnessing Hamaguchi’s destroyed farm, the villagers looked to the bottom of the hill only to see their village now under the ocean; the tsunami had engulfed their small coastal village. Hamaguchi, having remembered stories of old passed down to him by his grandfather, had destroyed his investment for the sake of saving the local people. The story of Hamaguchi illustrates how local knowledge can serve to empower communities in times of disaster. More importantly, it highlights how national and international frameworks can benefit from incorporating the local level into emergency planning. And how fitting that this is where the Sendai Framework came to be. Sendai has incorporated a much stronger voice of resilience, that is, what we do to prevent the impacts of disasters before they occur, rather than only to rebuild after the disaster has been and gone. But what is a ‘disaster’? Sendai recognises that disasters ‘occur within society, not nature’, meaning that as a society, it is our perception that turns an event into a disaster. A light afternoon shower is not deemed a disaster, because people are not seen to be vulnerable in this situation, unless of course you have a wedding planned. Given this new wave of resilience-based language throughout the 2015 Sendai Framework, populations and communities that are deemed vulnerable to a disaster need to be placed front and centre in disaster planning and emergency management. Those that are worst impacted by a disaster now need to be prioritised. So while Sendai may be a global framework that sits within the United Nations system, the core of Sendai speaks about the importance of incorporating local knowledge into resilience building, starting with the most vulnerable first. It highlights the role of local government. It aims to bring everyone together, both within and between communities, to make sure that people are resilient to risk. Yet, despite this new language outlined by the Sendai framework, there is still a way to go in placing the most vulnerable at the centre of emergency management in NSW and Australia. If communities are disaster resilient, every member is aware of the hazards and risks in their own life, and how to respond to these hazards when they occur. The Community Resilience Innovation Program (CRIP) project, currently based out of the Inner Sydney Voice office, aims to do exactly that – bring people together within social housing communities to provide a platform to voice priorities, needs, and wants. It’s about creating a two-way communication stream between policy makers, implementers, and community members of Australia so that we can learn to work together to build lasting partnerships for a stronger, more resilient community. Yet, partnership building is a long-term process that not only requires strong collaboration, but requires a culture shift between emergency services and communities at large. “The greatest good for the greatest number of people” is a phrase often heard within emergency service circles. The statement refers to the quick decisions that first responders need to make when choosing, for example, which unit or floor to search during a building fire and, thus, which people to assist first. Here, preference is usually given to protecting the most number of people in the limited time available. It is important to remember that disasters occur within society, not in nature. In this example, those who are prepared have a personal emergency plan, listen to early warning systems and have a bag packed ready to leave the building early so often won’t need assistance in evacuating. The negative impacts of a disaster can be mitigated, and one could see the fire for just what it is – a fire – and not a disaster. The opposite can also be said. Those who are more vulnerable to a disaster, such as those who are less mobile, need regular medication, have a particular disability, or are already a member of a marginalised societal group, are more likely to perceive a hazard as a disaster. Why? Leaving a 20 storey building when the elevator isn’t working can be tiring for the best of us, forgetting your urgent medication when you are already out of the building could become fatal. And what if you are now forced to live in an environment where you don’t feel comfortable? Past experiences will influence the way people, as individuals, perceive an event. Is a building fire an event or a disaster to you? Clearly, people experience events in different ways. That’s why vulnerability needs to be front and centre in emergency management, and not a secondary business. We need to do more as individuals to prepare ourselves for a disaster. We need to know the likely risks around us. 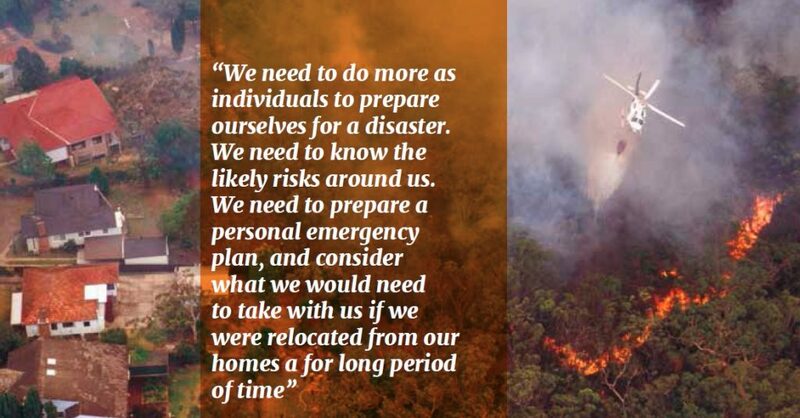 We need to prepare a personal emergency plan and consider what we would need to take with us if we were relocated from our homes for a long period of time. We need to think about our friends, our family, our neighbours and our pets in these situations. Above all, we need to take responsibility for our own disaster resilience and as a community, share the responsibility of looking after the more vulnerable around us. Make a personal emergency plan and discuss with friends, family, or neighbours. He was the most influential resident of the village to which belonged: he had been for many years its muraosa (headman); he was not less liked than he was respected, giving him the status of ‘grandfather’ by some 400 people in the quite little village. But, as the richest man in the village, Mr Hamaguchi Gohei was much more than the village grandfather. He would offer advice to smaller farmers about their interests, arbitrate local disputes, and on occasion advance money to those in times of need. Hamaguchi’s big thatched farmhouse stood at the verge of a small plateau overlooking a bay. The plateau, mostly devoted to rice culture, was hemmed in on three sides by thickly wooded summits. From its outer verge the land sloped down in a huge green concavity, as if scooped out, to the edge of the water; and the whole of this slope, a mile long, was so terraced as to look, when viewed from the open sea, like an enormous flight of green steps, divided in the centre by a narrow white zigzag – a streak of a mountain road. One autumn evening Hamaguchi was looking down from the balcony of his house at some preparations for a merry-making festival in the village below. There had been a very fine rice crop, and the peasants were going to celebrate their successful harvest; paper lanterns and festival banners fluttered above the roofs and streets. The old man had nobody with him but his little grandson, a lad of ten; the rest of the household having gone early to the village. The day had been oppressive. In spite of a rising breeze there was still in the air, that sort of heavy heat which according to the experience of the Japanese peasant, at certain seasons precedes an earthquake. And presently an earthquake came. It was not strong enough to frighten anybody; but Hamaguchi, who had felt hundreds of shocks in his time, thought it was odd – a long, slow, spongy motion; probably the after tremor of some immense seismic action very far away. The house crackled and rocked gently several times, then all became still again. As the quaking ceased Hamaguchi’s keen old eyes were anxiously turned toward the village. It often happens that the attention of a person gazing fixedly at a particular spot or object is suddenly diverted by the sense of something not knowingly seen at all, by a mere vague feeling of the unfamiliar. He rose to his feet, and looked at the sea. It had darkened quite suddenly, and it was acting strangely. It seemed to be moving against the wind. It was running away from the land. Within a very little time the whole village had noticed the phenomenon. Apparently no one had felt the previous motion of the ground, but all were evidently astounded by the movement of the water. They were running to the beach, and even beyond the beach, to watch it. No such ebb had been witnessed on that coast within the memory of living man. Things never seen before were making apparition; unfamiliar spaces of ribbed sand and reaches of weed-hung rock were left bare even as Hamaguchi gazed. And none of the people below appeared to guess what that monstrous ebb signified. Hamaguchi Gohei himself had never seen such a thing before; but he remembered things told in his early childhood by his father’s father, and he knew all the traditions of the coast. He understood what the sea was going to do. Perhaps he thought of the time needed to send a message to the village, or to get the priests of the Buddhist temple on the hill to sound their big bell… But it would take much longer to tell what he might have thought than it took him to think. He simply called to his grandson. The child kindled a torch at once and the old man hurried with it to the fields, where hundreds of rice-stacks, representing most of his invested capital, stood awaiting transportation. But Hamaguchi did not answer: he had no time to explain; he was thinking only of the four hundred lives in peril. For a while the child stared wildly at the blazing rice; then burst into tears, and ran back to the house, feeling sure that his grandfather had gone mad. Hamaguchi went on firing stack after stack, till he had reached the limit of his field; then he threw down his torch, and waited. The acolyte of the hill-temple, observing the blaze, set the big bell booming; and the people responded to the double appeal. Hamaguchi watched them hurrying in from the sands and over the beach and up from the village, like a swarming of ants, and, to his anxious eyes, scarcely faster; for the moments seemed terribly long to him. Really, however, Hamaguchi did not have very long to wait before the first party arrived, a score of agile young peasants who wanted to attack the fire at once. But Hamaguchi, holding out both arms, stopped them. The whole village was coming; and Hamaguchi counted. All the young men and boys were soon on the spot, and not a few of the more active women and girls; then came most of the older folk, and mothers with babies at their backs, and even children, for children could help to pass water; and the elders too feeble to keep up with the first rush could be seen well on their way up the steep ascent. The growing multitude, still knowing nothing, looked alternately, in sorrowful wonder, at the flaming fields and at the impassive face of their village leader. And the sun went down. Through the twilight eastward all looked, and saw at the edge of the dusky horizon a long, lean, dim line like the shadowing of a coast where no coast ever was, a line that thickened as they gazed, that broadened as a coast-line broadens to the eyes of one approaching it, yet incomparably more quickly. For that long darkness was the returning sea, towering like a cliff, and coursing more swiftly than the kite flies. “Tsunami!” shrieked the people; and then all shrieks and all sounds and all power to hear sounds were annihilated by a nameless shock heavier than any thunder, as the colossal swell smote the shore with a weight that sent a shudder through the hills, and with a foam-burst like a blaze of sheet-lightning. Then for an instant nothing was visible but a storm of spray rushing up the slope like a cloud; and the people scattered back in panic from the mere menace of it. When they looked again, they saw a white horror of sea raving over the place of their homes. It drew back roaring, and tearing out the bowels of the land as it went. Twice, thrice, five times the sea struck and ebbed, but each time with lesser surges: then it returned to its ancient bed and stayed, still raging, as after a typhoon. He, their leader, now stood among them almost as poor as the poorest; for his wealth was gone—but he had saved four hundred lives by the sacrifice. Little Tada ran to him, and caught his hand, and asked forgiveness for having said naughty things. Whereupon the people woke up to the knowledge of why they were alive, and began to wonder at the simple, unselfish foresight that had saved them; and the headmen prostrated themselves in the dust before Hamaguchi Gohei, and the people after them. The period of distress was long, because in those days there were no means of quick communication between district and district, and the help needed had to be sent from far away. But when better times came, the people did not forget their debt to Hamaguchi Gohei. They could not make him rich; nor would he have suffered them to do so, even had it been possible. Moreover, gifts could never have sufficed as an expression of their reverential feeling towards him; for they believed that the ghost within him was divine. So they declared him a god, and thereafter called him Hamaguchi DAIMYÔJIN, thinking they could give him no greater honour; and truly no greater honour in any country could be given to mortal man. And when they rebuilt the village, they built a temple to the spirit of him, and fixed above the front of it a tablet bearing his name in Chinese text of gold; and they worshiped him there, with prayer and with offerings. How he felt about it I cannot say; I know only that he continued to live in his old thatched home upon the hill, with his children and his children’s children, just as humanly and simply as before, while his soul was being worshiped in the shrine below. A hundred years and more he has been dead; but his temple, they tell me, still stands, and the people still pray to the ghost of the good old farmer to help them in time of fear or trouble. Dominey-Howes, D., Gorman-Murray, A. McKinnon, S. 2016, ‘Emergency management response and recovery plans in relation to sexual and gender minorities in New South Wales, Australia’, International Journal of Disaster Risk Reduction, vol. 16, pp. 1-11. Victorian Council of Social Service 2017, ‘Building resilient communities’, viewed 12 March 2018, <http://vcoss.org.au/documents/2017/05/Building-Resilient-Communities.pdf>. United Nations Office for Disaster Risk Reduction (UNISDR) 2015, ‘Sendai Framework for Disaster Risk Reduction 2015-2030’, viewed 12 March 2018, <https://www.preventionweb.net/files/43291_sendaiframeworkfordrren.pdf>. Sako-Ikegami, K. 2011, ‘The tale of Hamaguchi Gohei and the tsunami’, Japan Translation Group, viewed 12 March 2018, <https://ihatov.wordpress.com/2011/04/09/hamaguchi-gohei-a-living-god-by-lafcadio-hearn/>.